Primarily hepatic, cobalamins are absorbed in the ileum and stored in the liver. 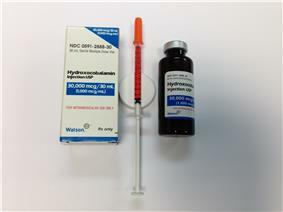 Hydroxocobalamin injection USP (1000 mcg/mL) is a clear red liquid solution of hydoxocobalamin which is available in a 30 mL brown glass multidose vial packaged in a paper box. Shown is 500 mcg B-12 (as 1/2 cc) drawn up in a 1/2 cc U-100 27 gauge x 1/2" insulin syringe, as prepared for subcutaneous injection. Hydroxocobalamin (OHCbl, or B12a) is a natural form, or vitamer, of vitamin B12. It is a member of the cobalamin family of compounds. Hydroxocobalamin is produced by many bacteria that are used to produce the vitamin commercially. Like other forms of vitamin B12, hydroxocobalamin has an intense red color. In humans, it is rapidly converted to usable coenzyme forms of vitamin B12. Hydroxocobalamin is used as an injectable solution for treatment of the vitamin deficiency and for treatment for cyanide poisoning. It has been tested as a scavenger of nitric oxide. the activation of methionine synthase, which is the rate-limiting step in the synthesis of methionine from homocysteine and 5-methyltetrahydrofolate. OHCbl acetate occurs as odorless, dark-red orthorhombic needles. The injection formulations appear as clear, dark-red solutions. It has a distribution coefficient of 1.133 × 10-5 and a pKa of 7.65. Malabsorption of vitamin B12 resulting from damage to the stomach, where intrinsic factor is secreted, or damage to the ileum, where intrinsic factor facilitates vitamin B12 absorption. These conditions include tropical sprue and nontropical sprue. Competition for vitamin B12 by intestinal parasites or bacteria. The tapeworm from undercooked fish (Diphyllobothrium latum) absorbs huge quantities of vitamin B12, and infested patients often have associated gastric atrophy. The blind loop syndrome may produce deficiency of vitamin B12 or folate. Vitamin B12 compounds are used as a prescription medicine (injection) for vitamin B12 replacement therapy, usually at 100 µg/dose. In the UK, 1,000 µg (1 mg) per dose is generally used. Damage that results from vitamin B12 deficiency can be prevented with early diagnosis and adequate treatment. For most, the standard therapy for treatment of vitamin B12 deficiency has been intramuscular (IM) injections in the form of pediatric patients with intrinsic cobalamin metabolic diseases; vitamin B12-deficient patients with tobacco amblyopia due to cyanide poisoning; and patients with pernicious anemia who have optic neuropathy. In a newly diagnosed vitamin B12-deficient patient, normally defined as when serum levels are less than 200 pg/ml, daily IM injections of OHCbl up to 1,000 μg (1 mg) per day are given to replenish the body’s depleted cobalamin stores. In the presence of neurological symptoms, following daily treatment, injections up to weekly or biweekly are indicated for six months before initiating monthly IM injections. Once clinical improvement is confirmed, maintenance supplementation of B12 will generally be needed for life. Hydroxocobalamin has also been used in the treatment of cyanide poisoning. Cyanide displaces the hydroxo ligand forming a stable cyanocobalamin. In addition to binding cyanide, hydroxocobalamin is a scavenger of nitric oxide. It has been used tested to modify nitric oxide-mediated inflammation. For example, a hydoxocobalamin skin creme was found to reduce chronic skin inflammation. Hydroxocobalamin has also been used in a pilot-study treatment of migraines, as an inhibitor of nitric oxide-induced vasodilation. The literature data on the acute toxicity profile of OHCbl show it is generally regarded as safe with local and systemic exposure. The ability of OHCbl to rapidly scavenge and detoxify cyanide by chelation has resulted in several acute animal and human studies using systemic OHCbl doses at suprapharmacological doses as high as 140 mg/kg to support its use as an intravenous (IV) treatment for cyanide exposure (Forsyth et al., 1993; Riou et al., 1993). The US FDA at the end of 2006 approved the use OHCbl as an injection for the treatment of cyanide poisoning. The term "vitamin B12" refers to a group of compounds called cobalamins that are available in the human body in a variety of mostly interconvertible forms. Together with folic acid, cobalamins are essential cofactors required for DNA synthesis in cells where chromosomal replication and division are occurring—most notably the bone marrow and myeloid cells. As a cofactor, cobalamins are essential for two cellular reactions: (1) the mitochondrial methylmalonyl coenzyme A mutase conversion of methylmalonic acid (MMA) to succinate, which links lipid and carbohydrate metabolism, and (2) activation of methionine synthase, which is the rate limiting step in the synthesis of methionine from homocysteine and tetrahydrofolate (Katzung, 1989). Cobalamins are characterized by a porphyrin-like corrin nucleus that contains a single cobalt atom bound to a benzimidazolyl nucleotide and a variable residue (R) group. The variable R group gives rise to the four most commonly known cobalamins: CNCbl, methylcobalamin, 5-deoxyadenosylcobalamin, and OHCbl. In the serum, OHCbl and CNCbl are believed to function as storage or transport forms of the molecule, whereas methylcobalamin and 5-deoxyadenosylcobalamin are the active forms of the coenzyme required for cell growth and replication. CNCbl is usually converted to OHCbl in the serum, whereas OHCbl is converted to either methylcobalamin or 5-deoxyadenosyl cobalamin. Cobalamins circulate bound to serum proteins called transcobalamins (TC) and haptocorrins. OHCbl has a higher affinity to the TC II transport protein than CNCbl, or 5-deoxyadenosylcobalamin. From a biochemical point of view, two essential enzymatic reactions require vitamin B12 (cobalamin). Intracellular vitamin B12 is maintained in two active coenzymes, methylcobalamin and 5-deoxyadenosylcobalamin, which are both involved in specific enzymatic reactions. In the face of vitamin B12 deficiency, conversion of methylmalonyl-CoA to succinyl-CoA cannot take place, which results in accumulation of methylmalonyl-CoA and aberrant fatty acid synthesis. In the other enzymatic reaction, methylcobalamin supports the methionine synthase reaction, which is essential for normal metabolism of folate. The folate-cobalamin interaction is pivotal for normal synthesis of purines and pyrimidines and the transfer of the methyl group to cobalamin is essential for the adequate supply of tetrahydrofolate, the substrate for metabolic steps that require folate. In a state of vitamin B12 deficiency, the cell responds by redirecting folate metabolic pathways to supply increasing amounts of methyltetrahydrofolate. The resulting elevated concentrations of homocysteine and MMA are often found in patients with low serum vitamin B12 and can usually be lowered with successful vitamin B12 replacement therapy. However, elevated MMA and homocysteine concentrations may persist in patients with cobalamin concentrations between 200 to 350 pg/mL (Lindenbaum et al. 1994). Supplementation with vitamin B12 during conditions of deficiency restores the intracellular level of cobalamin and maintains a sufficient level of the two active coenzymes: methylcobalamin and deoxyadenosylcobalamin. ^ "Hydroxocobalamin Pregnancy and Breastfeeding Warnings". ^ Dart, Richard C. (1 January 2006). "Hydroxocobalamin for Acute Cyanide Poisoning: New Data from Preclinical and Clinical Studies; New Results from the Prehospital Emergency Setting". Clinical Toxicology 44 (s1): 1–3. ^ Shepherd G, Velez LI (May 2008). "Role of hydroxocobalamin in acute cyanide poisoning". Ann Pharmacother 42 (5): 661–9. ^  Topical vitamin B12—a new therapeutic approach in atopic dermatitis—evaluation of efficacy and tolerability in a randomized placebo-controlled multicentre clinical trial.British Journal of Dermatology Volume 150, Issue 5, pages 977–983, May 2004. ^  An open study of hydroxocobalamin in migraine.